Mobility product specialist Gerald Simonds has helped a woman attend a family wedding with its all-terrain FreeWheel manual wheelchair add-on, enabling her to navigate uneven and tricky terrains. Lit Smith has a rare condition called SCA 1, which is an inherited form of cerebellar ataxia (similar to MS) that affects her speech and coordination, resulting in frequent falls. Her daughter got married this summer in a marquee in a field. During the wedding preparations, Lit realised she would need help getting her manual wheelchair across the rough terrain. She explained: “Pushing my wheelchair on grass had always been extremely hard work for myself and whoever was pushing me and just getting to the marquee as the build-up got underway was exhausting. After researching online, Lit came across the FreeWheel from Gerald Simonds. 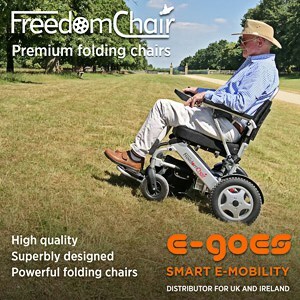 The FreeWheel attaches to the front of a manual wheelchair and lifts the front castors off the ground, therefore turning a standard wheelchair into a three-wheeler, which can handle almost any type of terrain such as grass, kerbs and rough uneven roads. The large front wheel has less resistance than small castors, making it easier to roll on any surface, whether the user is alone or with a companion. “The FreeWheel is just brilliant,” said Lit. “As soon as we had fitted the adaptor to my wheelchair and then attached the FreeWheel off I went towards the marquee to see how everything was progressing. “The day itself was amazing and thanks to the FreeWheel I did not miss out on any of the celebrations. Established in 1983, Gerald Simonds is a supplier of lightweight manual, powered and standing wheelchairs, powerdrives, seating and pressure care products.